So this is the first action of the campaign and not unexpectedly, it is a naval battle. A British force of MTB's and MGB's have put ashore several units of Royal Marines Commandos on the small island of Kasos off the southern tip of the much larger island of Karpathos. As night falls the mist clears and for the first time all day the weather settles. In the meantime a German flotilla of Torpedo Boats are on routine patrol to the south of Kasos. 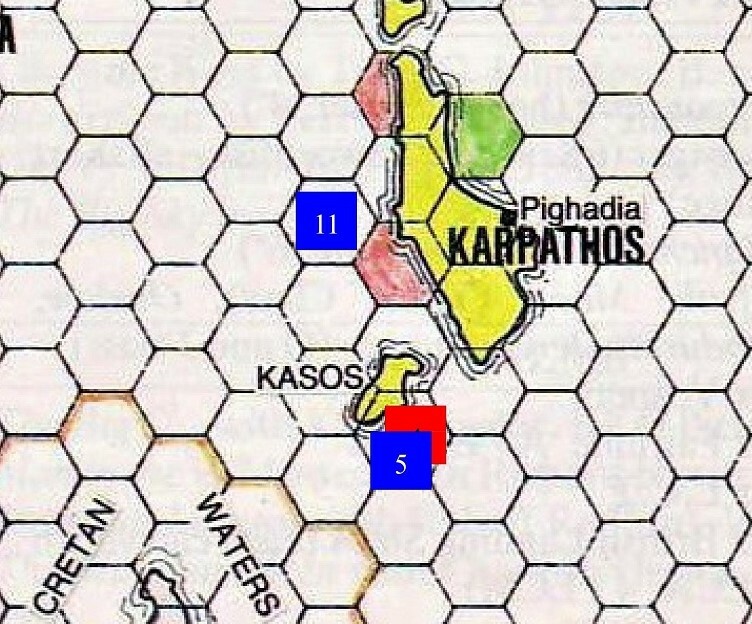 They turn northwards to run past Kasos not expecting any enemy vessels to be in the area. As they approach the island a lookout on the German Torpedo Boat Albatross sees several small craft moving away from the beach. 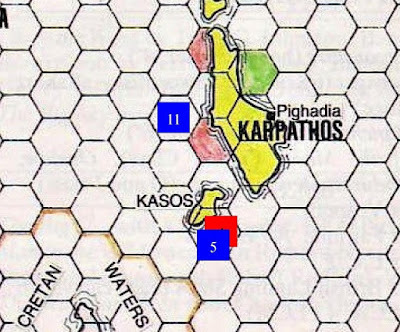 Zooming in on the map shows the proximity of the action to Karpathos and the scene of the first battle. As this is a small coastal action I will be using David Manley's 'Action Stations' edition 4 rules. I have only used an earlier version of the rules once several years ago so it is a steep learning curve. I am sure mistakes will be made but hopefully not that will affect the outcome too much. The British Force as it begins it's departure from Kasos. The German Flotilla as it heads north. The Torpedo Boat flotilla moves at cruising speed (roughly half maximum) northwards as the coastline of Kasos looms into view. Commandos on the beach observe as the small craft of the Royal Navy begin their departure. They need to return to Cyprus in order to refuel and for their next tasking. Another shot from the cliffs overlooking the bay. Both fleets not yet in sight of each other. A visibility test determines the maximum visibility to be 60cms. The bows of the MTB's and Elco MGB lift out of the water as they steadily increase their speeds. After the first move we arrive now at the point as described in the campaign where the first sighting is made. The Albatross is the first German ship to sight an MTB. At this stage only it's forward facing 4.1" gun and 2 x 20mm guns are in a position to fire. They open up with their first salvo. Despite the darkness the 4.1" proves to be remarkably accurate and hits MTB 350. The 20mm guns churn up the water around the MTB but fail to hit. A hit by a 4.1" shell on such a small craft is potentially devastating. A double '1' is thrown by the Germans resulting in just one hull box lost. Clearly a glancing hit. The crew though are suppressed potentially meaning that this vessel will be out of action for the next turn. Fortunately they rally in the end phase and quickly get back to their stations. The Germans alter course to prevent the British from escaping. The Royal Navy has other ideas and all their craft turn in towards the Torpedo Boats with the intention of attacking. Realisation dawns on the Germans that they could be on the receiving end of torpedo attacks. Their confidence is shaken and all ships that are able are ordered to use all available weapons to destroy their attackers. The Albatross has clearly found the range of MTB 350 and scores 2 hits from it's 4.1" guns. This time the MTB is not so lucky and is utterly destroyed. MGB 313 opens fire with it's 2pdr guns on T24. The larger German vessel is too heavily armoured for the small guns on the MGB to inflict hull or turret damage but it can still cause problems. Alas the Special Effects test proved to be ineffectual. The remaining German ships fired but unlike the Albatross failed to score any hits. Never easy on such small craft and at night. MTB 347 and MTB 349 found themselves in a great firing position for their 21" torpedoes. The 2 torpedo tubes from each boat emptied with 2 German ships targeted. All 4 were close enough to test for hits. The crew of the T24 looked on as one torpedo track sped past their ship. The other struck amidships but proved to be a dud. The two torpedoes that struck the Albatross though exploded lifting the ship out of the water and breaking her back. In the resulting inferno the Albatross had ceased to exist quickly sinking to the bottom with all hands. The only MTB left with torpedoes, the 348, is unable to get into a decent firing position and is in danger of being too close the the German vessels for the torpedoes to arm in time. The British boats therefore turn south with a view to escaping rather than continuing to engage in what will be a very one-sided affair. Now increased to full speed the MTB's and MGB's speed past the German flotilla. MGB 313 found itself uncomfortably close to the T24. The latter fired off a broadside with all its available armaments (photo above) raking the MGB. Most damaging of all was a direct hit from a 4.1" shell taking out 5 of its 7 hull boxes and causing a fire. The T24's quad 20mm also destroyed the starboard twin HMG. In reply the MGB 313 failed to cause any damage but did cause the German ship's gun crews to become suppressed (not the 4.1" turrets which are too heavily armoured). Another view of the firefight between the T24 and the MGB 313. The Mowe activates both it's port searchlights illuminating the MTB's 347 and 349. The Mowe opens fire on the nearest of the illuminated targets, the MTB 349. A 4.1" shell decimates the MTB leaving it sinking. The German flotilla risks grounding in the shallows around Kasos and turns hard to port. The Elco MGB 82 and MTB 347 race to the south putting as much distance between them as possible. The elite crew of the MTB 348 decide to try and gain a firing position for the last of the torpedoes in an effort to save the MGB's 312 and 313. As it turns hard to port it inadvertently becomes illuminated by the fire on the MGB 313 (middle right of photo). Once again the Mowe's 4.1" guns find their mark with one shell landing on the deck of the MTB reducing it to a smouldering ruin. The smaller calibre guns from the Mowe fired on the MGB 313 destroying its port twin LMG. It was not all one sided though as the MGB 312 (middle of photo) fired on the Mowe destroying its quad 20mm gun mount and suppressing it's gun crews. However, the MGB found itself illuminated by a searchlight from the T24. The T24 (right in the photo) fired on the MGB reducing it from 7 to 1 hull box and destroying its starboard twin HMG mount. By the time the Germans had completed their turn the surviving British boats had put enough distance between them to beyond visibility range. The MGB's were not safe yet as both crews fought to prevent them from sinking. MGB 313 (on fire bottom right) had already lost another hull box due to flooding and they had failed to extinguish the fire. Another attempt at stifling the flooding failed and the 313 keeled over and began to sink. The elite crew of the MGB 312 had better luck and skill. With one hull box left they brought the flooding under control. The German flotilla now abandoned the chase. The Mowe had suffered a lost gun mount which would have to be repaired in port but not an urgent matter. The British lost 3 MTB's and an MGB. The survivors would now make their way back to Cyprus for repairs and refuelling. That brings to conclusion the first battle of the campaign. Overall a nice break from land battles and the rules proved to be fun to play. I am sure I have made mistakes occasionally and I did not deploy star shells which I should probably have considered. A note on the photos. I dimmed them to at least bring some semblance of night rather than completely turn the lights out! A very spirited action, great stuff! Your comments really appreciated David. You have a great set of rules there. A stirring account and a good augury for the Axis forces (or perhaps a bad one for the Allies!). I've been on the island of Karpathos. We heard about the savage winds that would gust down the steep coastline that was such a hazard to shipping hundreds of years ago, On a boat trip to the north end of the island, such a gust picked up one of the seats on the port side and flung it across to where I was sitting with a couple of female companions. Advancing to meet it I managed to catch it without difficulty. Feeling no end of a hero, i dropped one end, the corner of the leg landing on my big toe. Hubris. Ain't it a bugger, though? I have yet to visit the Greek islands (other than Corfu) and is on my bucket list of things to do. Had to laugh at your amusing experience with a wayward chair. I have sailed through the Med in my Merchant Navy days and it can get surprisingly rough. It occasionally put the Atlantic to shame! Crikey. One hell of a gust of wind to launch that at you. Yep, definitely take the Ouzo. Looks like you deserved it. Way outside my usual zone, but a nice read regardless!